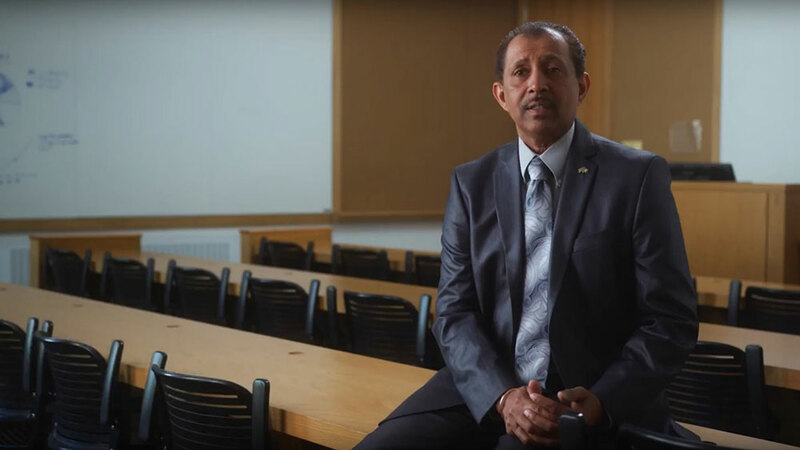 Roger A. Ramsammy, Ph.D. became the seventh president of Hudson Valley Community College on July 1, 2018. President Ramsammy has earned numerous awards for leadership, effective and inventive teaching, online instruction and academic program development, including the Virginia Governor's Award for the most innovative STEM program; the Florida Association of Community Colleges and Palm Beach State College Professor of the Year awards; and the Adjunct Professor of the Year award at Broward College. He was the recipient of the Martin Luther King Jr. Cultural Foundation Outstanding Educator Award for his dedication to educational outreach for underserved populations and awarded an honorary doctorate of research by Isaac Newton University in Ciudad Quesada, Costa Rica. In addition, he was invited to participate in President Obama's STEM Education College Opportunity Initiative and led Northern Virginia Community College's contingent at White House meetings. President Ramsammy currently serves on the American Association of Community Colleges Commission on Structured Pathways, where he was previously a commissioner for Academic, Student and Community Development as well as Diversity, Inclusion and Equity. He also currently serves on the United Way’s Board of Directors, as well as its Community Impact and Investment Committee; the Center for Economic Growth’s Advanced Manufacturing Workgroup; and the Regional Economic Development Council. President Ramsammy is a first-generation college student who recognizes the extraordinary potential of education to change both individual lives and communities. Prior to a post-doctoral fellowship at Georgetown University's Lombardi Cancer Center, he earned a Ph.D. in Molecular Biology and a master's degree in Genetics from Howard University. He holds a bachelor's degree in Biology from the University of the District of Columbia. President Ramsammy was officially approved as Hudson Valley's seventh president by the college's Board of Trustees on Oct. 25, 2017 and by the SUNY Board of Trustees on Nov. 15, 2017. He began his tenure at the college on July 1, 2018 and follows former college presidents Dr. Andrew J. Matonak (2005-2018), Dr. Marco J. Silvestri (interim appointment from 2004-2005); John Buono (1998-2003); Dr. Stephen M. Curtis (1996-98); Dr. Joseph J. Bulmer (1979-1996); James J. Fitzgibbons (1965-1979); and Otto V. Guenther (1953-1965).